ST. PETERSBURG, Russia (AP) — If Lionel Messi needed extra motivation for Argentina’s crucial World Cup game against Nigeria, then an opposing player may have just given him some. Messi has 552 goals for Barcelona and 64 for Argentina, but has yet to score in Russia. 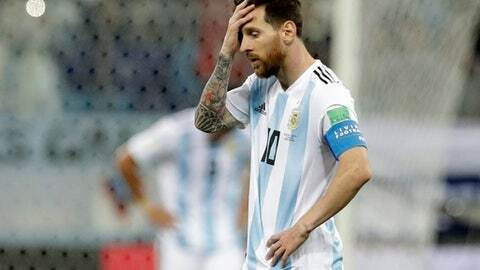 He missed a penalty in Argentina’s 1-1 draw with Iceland and then had a frustrating game in the 3-0 loss to Croatia. Idowu, who was born in St. Petersburg, is tipped to start Tuesday’s game at left back. He scored when Nigeria beat Argentina 4-2 in a friendly in the Russian city of Krasnodar last November. Argentina led 2-0 after 36 minutes, and then its defense capitulated. Nigeria coach Gernot Rohr is determined Messi doesn’t star again, even though unashamedly a fan of the five-time world player of the year. Nigeria’s attack is set to be led by Ahmed Musa, who scored twice in Nigeria’s 2-0 win against Iceland last Friday. Musa also netted both of Nigeria’s goals in that 3-2 World Cup defeat four years ago, and he set up Nigeria’s fourth goal in last November’s friendly win. Given that Musa was overlooked by Leicester coach Claude Puel in Premier League games last season, he went on loan to CSKA Moscow in a bid to prove to Rohr that he was worthy of holding down a place on Nigeria’s World Cup squad. Musa netted six goals in 10 matches for CSKA, but that’s not what really impressed Rohr.